The Terraces Forums help keep you informed and about what's happening in our neighborhood and around the city. They also provide a way to communicate with your neighbors and the ITHA board and committees. Announcements and discussion threads in the forums may involve community events, gardening, local history, homes, kids, neighborhood watch, schools, and whatever else is important or interesting to you and other members. The forums are funded and hosted by ITHA. They contain no ads or spam. Forum Portal Displays recent posts in all forums. If you are not logged in, only public forums are shown. ITHA Announcements Notices of Ingleside Terraces meetings and events. SF Announcements Information on city-wide meetings and events. Forum Home A top-level list of all the forums. Use this page to navigate through all forums. Neighbor-to-Neighbor Neighborly back-and-forth (does anyone know a good handy-man?). Recommended Businesses and Contractors This is a handy thread in the Neighbor-to-Neighbor forum. Neighborhood issues Discussions of issues that affect Ingleside Terraces. City issues Discussions of issues affecting our fair city. ITHA Polls From time-time the ITHA board and its committees may conduct a poll among the membership. Feedback on the Forum site Help us improve the forum. Register as a member and join the conversation on the members-only pages. Membership is free, but is limited to Ingleside Terraces residents and property owners. Many of you may wish to have easy mobile access to these forums. While you can use a mobile web browser, it is not an optimum experience on a small screen. Therefore, we have enabled access through a free mobile application. 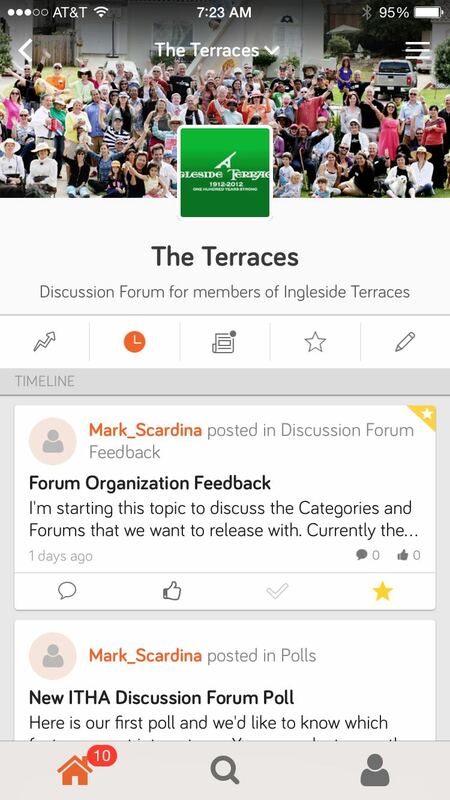 Once you install the app and create a free Tapatalk account, you can search for "Terraces" and you will find our discussion forums. You can then select and sign in with your user name and password. You will then have complete ability to access and particpate while on-the-go.